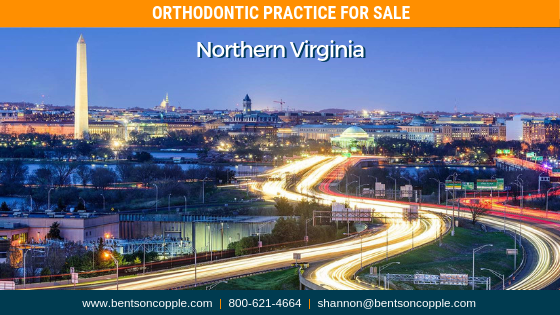 An established private orthodontic practice located in Northern Virginia is for sale. The practice located in the Shenandoah Valley is one of the fastest growing communities in the greater Washington, D.C. metro area. The area is popular for residents who can accommodate a long commute to the D.C. area, but have the desire to live a smaller community. The area’s accolades include ranking #17 on Sperling’s “Best Emerging Places to Live” and #11 on Forbes “Best Small Places for Business and Careers” in 2018. The area has a strong and diverse economic base with well-recognized employers including; HP Hood, Kraft Foods, M&H Plastics, Navy Federal Credit Union, Rubbermaid, Miller Milling, McKesson, and Thermo Fisher Scientific. State officials project the county’s population will increase by 30.6% while its employment growth is expected to increase by 25.2%, indicating that this is a great community for an orthodontic practice! To learn more about this practice opportunity, please forward your CV and letter of interest to Shannon Patterson at shannon@bentsoncopple.com. Click here to view additional practice opportunities available from Bentson Copple & Associates. © Copyright 2019. Bentson Copple & Associates. All Rights Reserved. · Website designed and developed by Atlantic Webworks.